Late in June of 1776, the New York Provincial Convention (NYPC) received a troubling report from the Dutchess County Committee of Safety. It said that Poughkeepsie officials and patriot warships were being threatened by loyalists, so-called Tories. To control them, the committee requested that one hundred men be sent immediately. Egbert Benson, chairman of the committee, wrote, “… sundry disaffected and danger­ous persons ….who greatly disturb the peace… will most probably take up arms.” Well intentioned officials agreed to send two companies of soldiers, but when recruitment stalled, Poughkeepsie officials implemented Plan B. They called for help from friends in Litchfield County, Connecticut. The response was quick and overwhelming. Connecticut men not only responded to the Poughkeepsie alarm, they marched to another one at Peekskill. There were several places in the lower Hudson River Valley where loyalists were on a rampage. 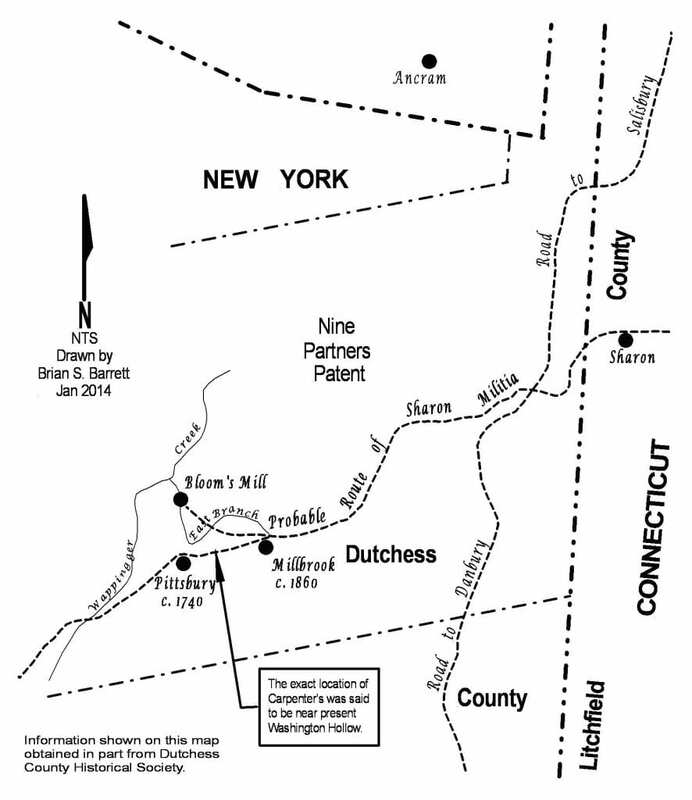 The area known as “Nine Partners Patent” in Dutchess County was one. It was said that Tories actually formed a regiment, joined the King’s army and were waiting for orders. They were headquartered near Poughkeepsie and within striking distance of Sharon, Connecticut. The Sharon Militia was responsible for guarding food and weapons stored within its jurisdiction. During the summer of 1776, militiamen within a hundred miles of New York City were expecting an invasion. Rightly so, with 8000 British troops on Staten Island and more than 100 enemy ships anchored in the harbor, patriots had good reason to be concerned. Add rambunctious Tories to the mix and residents of Sharon were jumpy. It was rumored that the British would take control of the Hudson River Valley and eventually attack Connecticut. The enemy needed flour, fresh meat and produce and Litchfield County farms had what it needed. But defenders of the home front were ready and willing to take up arms against them. This article recounts the fifteen-day activities of Litchfield County militiamen at Poughkeepsie and Peekskill. An all-important harvest in the town of Sharon was under way when militiamen were ordered to apprehend rene­gades in Nine Partners Patent. As shown in Figure 1, this place was adjacent to Litchfield County and in the back­yard of the town of Sharon. Responding to an alarm at this time of year was risky business. Barley and wheat fields were almost ready for harvest and if left unattended grain would rot on the stalk. Hopefully, this muster would be short. Any farmer could use extra money and militia service provided it. A farmer had to pay the blacksmith, his minister, the shoemaker and other tradesmen. He raised oats, peas, bar­ley, wheat and corn but had little left for himself. He typically worked fifty or more acres, most of which was pasture and grain. He probably had an orchard, garden, a wood framed house and a substantial barn. Every year he butch­ered 1500-2000 pounds of pork and 1200 pounds of beef. His family’s survival was based on a successful harvest. He worked from sunrise until after dark. His success was judged by the straightness of furrows, right angle fences and the height of pitched stones; not by the miles he marched or musketry skills. 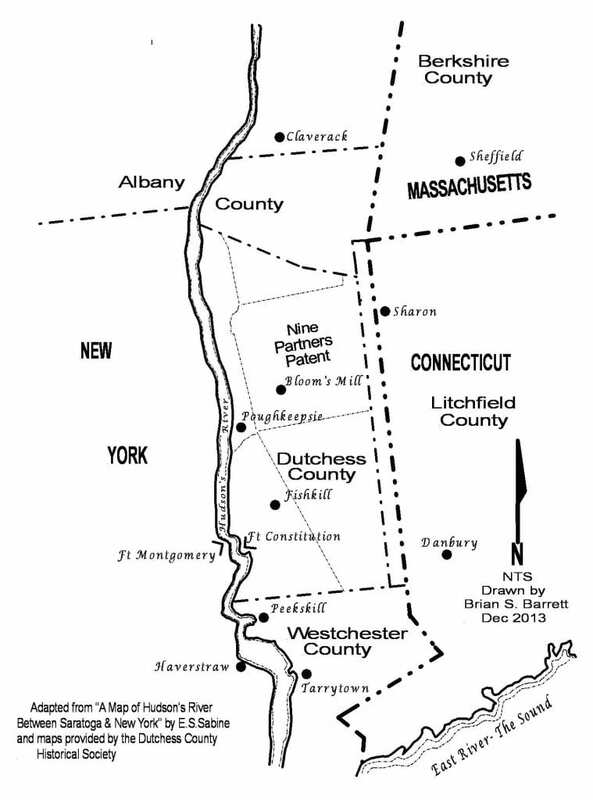 With many Litchfield County men already serving in Canada with Colonel Burrell’s 14th Connecticut, the western border was mainly guarded by militiamen from Sharon. A large contingent of them served under Major Ebenezer Gay. Their strength was over 300. At the time, this group was probably the largest patriot force in the vicinity of Poughkeepsie. The slightest prospect of an assault on the stores of Sharon was enough for officials to activate Major Gay’s forces. Accordingly, Sharon’s men mustered to eliminate the threat near Poughkeepsie. Major Gay’s first objective was to plan strategy with local patriots. Records show that he met on July 11 with Poughkeepsie officials somewhere near Bloom’s Mill on the East branch of Wap­pinger Creek. 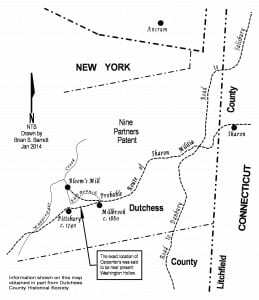 As shown in Figure 2, the most direct route to Bloom’s Mill was a road going west from Sharon that crossed the main road between Salisbury and Danbury. After a hard climb over the Taconic Mountains, the men marched south­west over hilly terrain to pre­sent day Millbrook. Another two miles northwest brought them to the vicinity of Bloom’s Mill. The entire trip probably took all day so the men would have billeted that night wherever they could. They could move fast. Unlike British regulars, militiamen carried only meager provisions. As a rule, one-fourth to one half of them actually carried muskets. The others were armed with only knives or tomahawks. Upon arrival at Bloom’s Mill, Major Gay learned that Tories previously gathered in small groups then, attacked and confiscated weapons from so-called “friends of liberty.” It was reported that some Tories even broke into the meeting cham­bers of the Dutchess Committee itself. But, Major Gay’s men were too far away to help. After a night’s rest, Gay’s detachment trav­eled about four miles south to a place called Carpenters. It was near Pittsbury (Washington Hollow) where they discovered 150-200 Tories practicing maneuvers in a meadow. When militiamen fired on them, the Tories broke rank and retreated. According to Egbert Benson, the Connecticut Militia pursued and captured thirty to forty of the enemy. If those captured were the leaders, the operation was completely successful and the threat all but gone. After the skirmish at Carpenters, captives were placed in confinement but who knows where. On July 12, Mr. Benson advised officials at Litchfield that Poughkeepsie jails were full. In his letter, Benson reported that he was sending eight prisoners to Litchfield and by agreement of John Canfield; four more would follow at another time. Canfield, an attorney from Sharon was apparently a member of Major Gay’s detachment as well. If the prisoners had money, it would be used for their upkeep. It was customary that prisoners paid their jailer for room and board. The most treacherous of them were sent to the copper mines at Simsbury, Connecticut or Exeter, New Hampshire. Benson said that all prisoners but one could support themselves. To sweeten the deal, Benson pledged that Dutchess County would reimburse expenses. It appears that only those with muskets were sent to Litchfield. The others most likely released with the promise to behave. Litchfield County men remained near Poughkeepsie for several days after the skirmish. While Major Gay’s detachment remained near Poughkeepsie, five British ships sailed past patriot gun batteries in New York City. The ships then headed up the Hudson River with designs on mountain passes near Peekskill. General Washington, alarmed by the prospect of losing control of these passes, implemented plans to prevent troops from off loading and marching north. He chose to defend a critical mountain pass at Peekskill near a place called Anthony s Nose. This place was just west of the Albany Post Road and was an ideal post for defenses. Finding men and weapons was the only challenge. Washington wasn’t fond of militiamen. He once stated that they could no more be depended upon than a broken staff. Unable to pull men from his own fortifications, he desperately needed them now. Consequently, he notified offi­cials from Dutchess arid Litchfield Counties to march their troops immediately to secure the pass at Anthony’s Nose. Washington was rightly concerned that the British might take command of this pass. Curiously, it was described as, “…a hill to the north of Peekskill so situated, with a road winding along the side of it, that ten men on top… rolling stones, could prevent as many (as a) thousand from passing…nothing more need be done than to keep… stones at different places where the troops must pass.” This description, seemingly primitive, is a vivid portrayal of its strategic value. Washington’s other defenses included Forts Constitution and Montgomery, the port at Peekskill and various stations in Westchester County along the Albany Road. 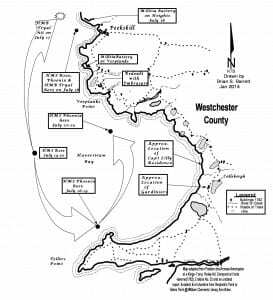 During the evening of July 12, while Litchfield County men bivouacked in Dutchess County, the enemy’s ships lay anchored in the Haverstraw Bay. But two days later, the ships moved up the Hudson and stopped opposite Verplank’s Point within view of men at Anthony’s Nose. On board, inquisitive eyes scanned the shoreline for a place to land. With Dutchess and Litchfield militiamen still two-days away, the prospects looked good. An anxious General George Clinton, then in command at Peekskill, warned Mr. Benson “…how necessary it is for the militia to be under arms and ready to march…” Benson, still feeling vulnerable, was reluctant to release his militiamen. Again, he appealed to the eastern militia. This time he called on Colonel Joshua Portor, his counter­part in Salisbury, Connecticut. But, Portor’s militiamen were already engaged in the Canadian assault. Therefore, Portor relayed the plea to General John Fellows in Sheffield, Massa­chusetts. General Fellows was the brigadier of the Berkshire County Militia and veteran of the Boston Siege. Portor advised Fellows, “…British ships and tenders passed up the North River to take possession of forts in highlands and ravage the country.” Alarmed by the news, Fellows ordered out one third of the Berkshire County Militia, about 300 men. But many of them were three days away. Apparently, the NYPC was less concerned about the ships. In a letter dated July 13th to Lt. Colonel Hammond, Westchester County’s militia commander, it was stated, “…There is no great reason to apprehend… any considerable incursions into the country…” The letter further stated, “…it would not be expe­dient for great numbers of the militia to leave their farms at this busy season of the year.” Some militiamen, guarding the eastern shore between Peekskill and the Croton River, took this as permission to go home. Without explanation, the NYPC or­dered that 150 men be sent immediately to guard the shoreline in Westchester County. An angry letter to Lt. Colonel Hammond dated July 15th, stated, “We are surprised to find that any of the men under your command… have left their stations without permission.” Unfortunately, security along the Westchester shore remained unsecured. No evidence was found to indicate that the reinforcements or­dered by it ever materialized. With the threat of Tories and the need to harvest crops, Dutchess County officials struggled to muster more men. Egbert Benson declared that “…inade­quacies of his militia, lack of arms and deserters who lurked in the woods…” were the reasons. He concluded, “Our all is at stake, I am not convinced that the least expensive mode of warfare is by suffering the whole body of farmers to be called out and harassed upon every occasion.” Obviously, Benson’s sympathy was with farmers. In spite of it, he ordered out what few men he could muster. 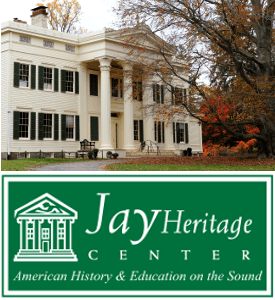 On July 15th, Joseph Travis, a local merchant who owned a dock and three warehouses on Peekskill Creek, requested that the NYPC send men to guard Continental Army stores. Mr. Travis feared the British would come ashore, destroy his property and seize valuable stores. While the quantity and type of supplies was unspecified, it was likely food, rum, and other supplies. The un­guarded shoreline and lightly guarded dock were surely communicated to the enemy. There were nightly excursions by local Tories between the shore and the ships. No doubt, weaknesses were also observed through spyglasses onboard enemy ships. After remaining in Haverstraw Bay for several days, one of the enemy ships sailed away from the formation and toward the west shore of the Hudson. Its objective was apparently to probe pa­triot defenses. On July 16th, it passed by the Dunderberg (Bear Mt.) and was turned back by well-aimed cannon fire. Patriot defenses, located on high ground at Fort Mont­gomery, hit their mark. Major Gay’s militiamen, now near Peekskill, may have heard the noise of the cannon fire. Certainly, they heard boisterous reports that patriots on the opposite shore hit their mark. It was a good day to celebrate. On the morning of July 17th, with much-needed troops were at Peekskill, residents breathed easier. Colonel Pierre Van Courtlandt and Captain Zephaniah Platt Jr., members of the NYPC, reported that, “About three o’clock Major Ebenezer Gay, of Sharon, came in with two hundred and sixty men.” If this count was correct, Gay’s detachment was smaller than it was at Poughkeepsie. Apparently, about forty men returned to their farms. But his detachment remained a respectable deterrent. Before the day ended, General Fellows and General Petrus Ten Broeck met Van Courtlandt and Platt at Fort Constitution. This fort was located near Peekskill in the vicinity of Anthony’s Nose. General Ten Broeck was the Dutchess County Brigadier. The men who would arrive soon needed provisions and accommodations. Van Courtlandt advised the NYPC that he planned to remain at Peekskill to “… provide for them and fix their stations.” This meant that he would arrange food and housing for militiamen and their horses. It was said that a whopping 600 militiamen congregated around Peekskill that evening. The spectacle was notable and news of it travelled fast. In country peppered with Tories, it didn’t take long for the news to reach the ships. As British sailors scanned Peekskill, their spyglasses filled with activity. Just as curious, patriots were awestricken at the sight of British warships. At the time, their destructive power was an abstraction but would soon become reality. As the sun set in Haverstraw Bay, British commanders contemplated the impact of the new arrivals at Peekskill. The next morning, in clear sight of the British, militiamen milled about the hills and shores. The British viewed only blocked landing sites. From their viewpoint, the defenses looked formidable, but up close there were deficiencies. Colonel Van Courtlandt reported that many of the New England men were unarmed – some without ammunition. Captain Platt, a militiaman himself, recognized this weakness and took up their cause. But the demands of the men and their animals were more than anyone anticipated. New York officials did their best but Washington’s Army took priority. Shortages at Peekskill persisted. When militiamen from Litchfield County heard that Westchester County men left their posts to harvest crops, they resented it. After all, what made Westchester’s harvest more important than theirs? As New England men took posts abandoned by Westchester men, it became an even bigger point of contention. Major Gay was challenged to ration­alize this predicament. But his men took their positions for the time being. On July 18th, amidst lightning, thunder and rain, Captain Hyde Parker, HMS Phoenix, ordered Captain James Wallace, HMS Rose, to test the patriot defenses at Peekskill. Wallace’s boat, a menacing warship, was 108 feet long and had twenty, nine-pound, cannons on her upper deck. 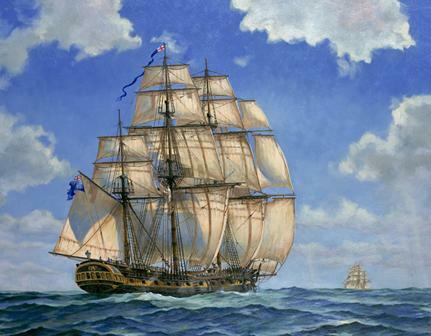 The Phoenix, a less intimidating schooner, had smaller cannons. But when Captain Wallace approached Peekskill he saw, “…a large Body of Rebels entrenched upon heights directly over them…” Fearing the prospect of another lucky shot, he turned away. Later, the enemy’s ships regrouped in Haverstraw Bay. At Fort Montgomery, on July 18th at ten o’clock in the morning, pa­triot officers held a Council of War. Their purpose was to coordinate a plan to defend both shorelines along the Hudson. In attendance were Captain Platt, Colonels Van Courtlandt and James Clinton, and Generals George Clinton, Ten Broeck and Fellows. While the outcome of their meeting was not fully docu­mented, they apparently concluded that additional reinforcements were unnecessary. There were 600 men available and 600 more were expected soon. At the time, an invasion also seemed unlikely. That evening, on board HMS Rose, Captain Wallace turned his attention to the west shore where one of his tenders ran aground. He needed to rescue the tender from patriot musketry. Apparently, militiamen took advantage of the situation. Wallace recorded in the ship’s log, “…we was fir’d at by a Number of Rebels (who were) arm’d…” Since no casualties were reported, each group was obviously out of range. As Major Gay and his men squinted at the ships on the far side of the bay, back home, Captain Simeon Smith prepared for trouble. Smith, a local physician, signed a receipt for eighteen guns and issued them to his men. In the absence of the main body of the militia, he prepared for the worst. Perhaps, Tories were again threatening stores. Officers at Peekskill, under pressure to release men for harvest, petitioned New York officials for dismissal and pay. Captain Platt, advised his superiors on July 21st that the men who came on horseback had no money to get home. New York officials responded favorably and ordered him, “…to provide for horses as well as the men… (and) give them a reasonable allowance …” With this news, Dutchess County militiamen packed up and left. Ten Broeck alleged, “…they needed to raise more men.” back home. Like their brethren, it was more likely the Dutchess men left to harvest crops. On July 22nd, after another Council of War, Colonel Van Courtlandt and Captain Platt advised New York offi­cials that, “…three hundred men would be sufficient to guard the east side of Hudson’s River, from Anthony’s Nose to Croton…” They noted that all New York troops withdrew and the burden of defense fell upon New England forces. The warned the NYPC that New England men would leave next Saturday. The tone of this message suggested that Van Courtlandt and Platt concluded that the enemy coming ashore was unlikely. With the departure of New England forces just five days away, the NYPC ordered that a regiment of Levies be immediately drafted from Westchester and Dutchess County militia units. Those conscripted would serve for a longer period but on July 23rd, amidst a dispute over the assignment of officers, things bogged down. With the earlier pronouncement of the Council of War that a large force of militia was unnec­essary, Major Gay’s detachment of about 260 men decided to leave. Departing on July 23rd, they got home two or three days later. While General Clinton was upset because they left without notifying him, he was solely dependent on New York reinforcements. During the summer of 1776, Connecticut’s farmer soldiers volunteered to quell an uprising in Dutchess County. Their mission evolved on the fly and they stayed much longer than expected. As subsistence farmers, many of them depended on harvest for survival and each day away increased the risk of future hardship. Regardless, the men from Litchfield County followed orders and persisted, as their counterparts from New York marched off. Near Poughkeepsie, Connecticut militiamen helped capture a number of rambunctious Tories. In so doing, they improved security around Poughkeepsie as well as their own farms. This accomplishment was eclipsed by Washington’s order for them to guard the pass near Anthony’s Nose. Litchfield County farmers complied with this order and stretched their enlistments. When New York officials requested that they guard Continental Army stores at Peekskill, they extended their enlistment once again. While these farmer soldiers were marginally compensated for their service, the most important pay-off was freedom and independence that came with the British surrender, five years later, at Yorktown. A version of this article was previously published in Sharon Achives, published by the Sharon Historical Society. 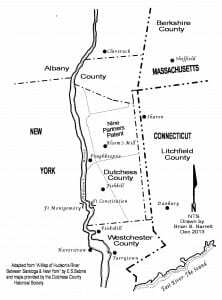 Having lived in Connecticut’s Litchfield County in the old days, before moving to the Empire State, I found this article very interesting. Thanks. Thanks for adding so much to the historical record! We will pass this along to our members who I know will be very interested. Could you please tell me if you are familiar with the Continental Naval ship “The Rogallie”? I am researching Private William Sobuck, who is listed as having served “aboard the Rogallie at Peekskill” from at least September-October in 1777. He joined the First Connecticut Regiment in January 1777 and served at Valley Forge. It would mean a lot to me to learn anything more about the Rogallie. Thank you. Never heard of that ship. I wonder if it was a mis-spell of row galley? 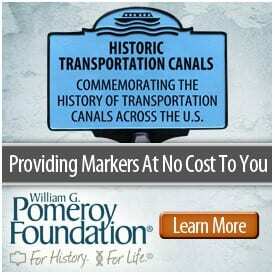 These flat bottomed boats were used extensively by patriots on and along the Hudson River. 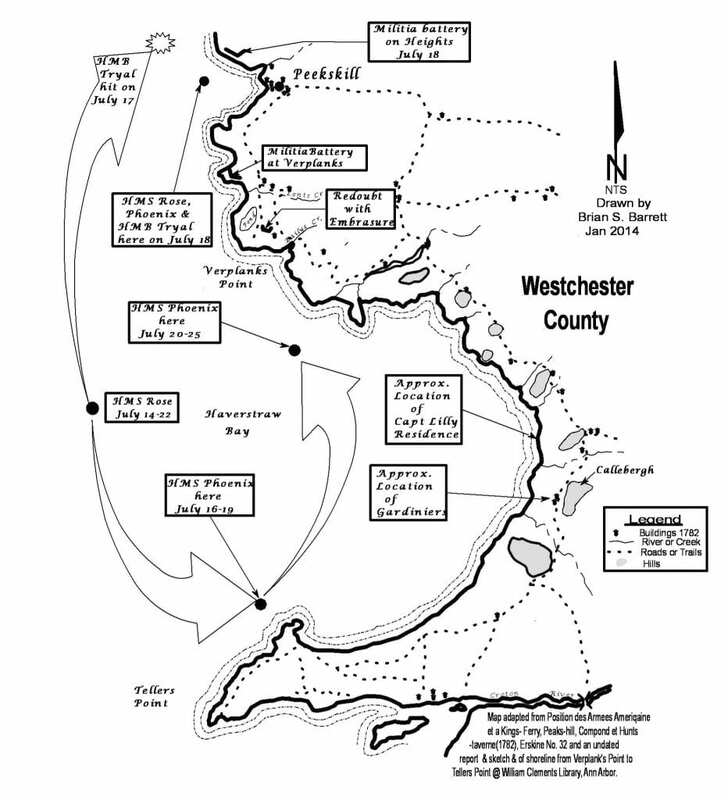 They were maneuverable in shallow water and tributaries like the Peekskill and Croton Rivers. They were readily assembled by local carpenters and manned by two to six rowers. Capt Sobuck may have commanded one and transported men and equipment for the army. He could easily escape British warships by seeking shelter behind islands and in coves. In my book, “Guarding Peekskill: The Berkshire Militia’s Role” I discuss the use of such boats by patriots and Tories alike.